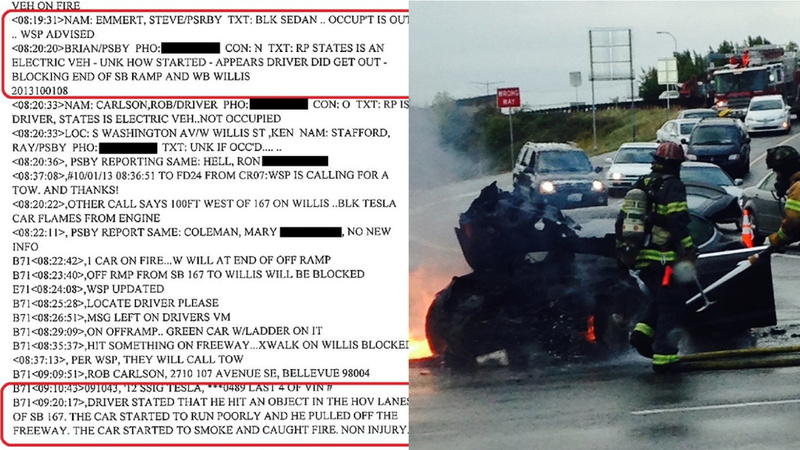 The Seattle-area fire department that extinguished the Tesla Model S blaze after the car crashed into some debris released more details tonight on the fire, saying a battery pack at the front of the car was burning and adding water made the flames worse. 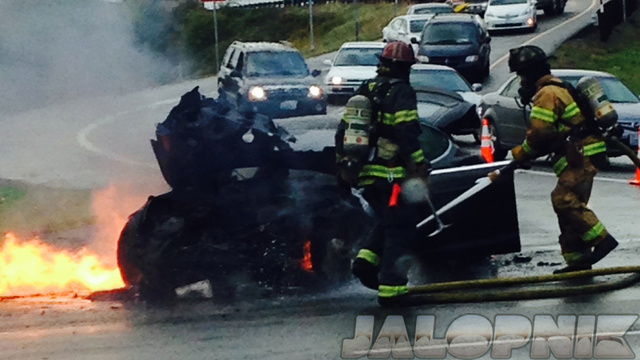 The following reports from the Kent, Washington Regional Fire Authority published by International Business Times and corroborated by the Associated Press confirm what a Tesla spokeswoman told Jalopnik about the crash, which occurred around 8 a.m. Tuesday on State Route 167. According to the report, firefighters arrived at the scene and found the car ablaze with an apparent "engine compartment fire," which they then extinguished. When they broke a window to gain access, the fire re-ignited. "The application of water seemed to intensify the fire activity," the report said. Firefighters ended up putting out the blaze with dry chemical extinguisher. When they took apart the front end, they found a battery pack still burning. The firefighter "had to puncture multiple holes in the pack to apply water to the burning material in the battery," the report said. 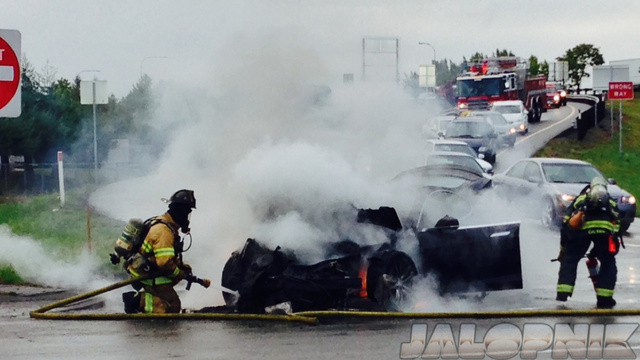 Firefighters also used a jack and cut into the frame of the car to spray water on the pack. At the moment we don't know whether the fire was caused by a mechanical issue or some kind of crash (although that front end looks pretty trashed), nor do we know if anyone was injured. I couldn't find anything in area news about it, so I'm hoping it wasn't too serious. If you have any insights, drop them in the comments. It's no secret that the Model S is a very impressive performer. Maybe it was just trying to compete with Ferrari in the wrong ways. Update: Here is a statement from officials at Tesla, who say the fire was caused by a crash that luckily injured no one and did not enter the car's cabin. Update: Either because of the video and photos of the Model S fire or because of a downgrade by Baird, or both, Tesla's stock plummeted this afternoon.